When I went in to town the other day, I took the opportunity to wear the pink pants I mentioned in this post...they're not exactly what I've been looking for but they're very close! I had a lot of fun trying them on with different tops - for now I like them best paired with this red sweater. I felt like this was a little bit Emma Peel and a little bit Ann Margret. Outfit details: scarf - ? ; 1950s sweater - etsy; belt - Valley Girl; pants - op-shop; shoes - KMart. Red and pink is one of my favourite colour combinations. When I was out I got some photos done in a photobooth. Sadly, the price is up to $8 so I'm not sure if it will be a regular occurrence though I would like it to be. 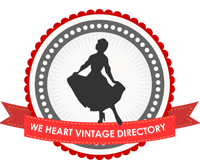 Oh, and be sure to take a look at the guest post/interview I did for We Heart Vintage. LOVE this outfit! I'm a big fan of pink and red together too. Ouch! $8 for photobooth pics? Most here are around $4. Sometimes I swear we're on the same sartorial wavelength, sweet gal! Earlier today I woke up thinking it would be so much fun if I had some vintage/vintage appropriate pink pants, and then your post - with just such a pair - pops up. Too cool! You beautiful - thanks for sharing your pretty pink trousers with us. This a superb look, I really like the red-pink combo and they way it gives an early 60s vibe to the whole outfit. I definitely need some pink trousers in my life, they are gorgeous! I always love your trouser outfits, maybe evern more than dresses! It does look like the bird is sitting on your shoulder! Really love the outfit! Love the combination of red and pink! The kookaburra is also very cute. You're looking totally badass, Miss Andi. Ooh I like the pink with the red, I think that's a great color combination too. Love those pants! And the sweater looks great with your red hair. I know there's supposed to be some "redheads shouldn't wear red" rule but I have never agreed! "...Usually I won't comment on my non-smiling face and I will certainly never apologise for it .."
Now, sometimes I do see you smiling a little bit in your photos...although never a huge, all-teeth grin like some people display...but it isn't as if you *don't* smile, and even if your mouth isn't making the shape of a smile, (IMO) it wouldn't mean that you aren't happy...is that right? Do people give you a rough time about "not smiling"? Just because you aren't showing your teeth all the time? I'll have to say that would get on my nerves with a quickness. I'm an American blonde woman, and, fortunately, in good humor a lot of the time...but I've had people (usually Y-chromies) "command" me to smile, for no reason, and I'll tell it to you straight: it only makes me want to SMILE as I'm biting their happy hands off. 2. if I am happy, must I display it to the world by showing my teeth?? Is that the only acceptable indication of "happiness"? Well Andi, how refreshing to be reminded that we women are not under obligation to SMILE, and in fact look perfectly pretty when we are not doing so. A smile is an indication of emotion, not a pair of earrings or a bracelet to be put on for show! Thanks for reminding us, you unsmiling maverick! I am loving that red hair on you more and more! I adore those pants! I often get told by people that I "need to smile more." I have heard this for ages so this post is especially refreshing!